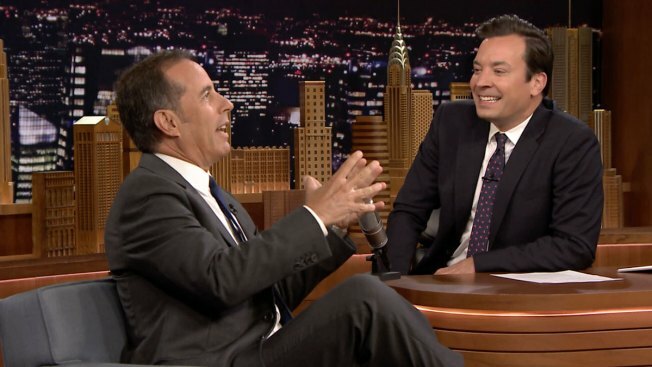 Jerry Seinfeld may be one of the funniest men on TV, but he's not joking when he says he doesn't want a hug. Unfortunately, Kesha had to find out the hard way. The two celebs attended The David Lynch Foundation's National Night of Laughter and Song on Monday night and happened to cross paths on the red carpet. Host of 94.7 Fresh FM's The Tommy Show in Washington D.C., Tommy McFly was mid-interview with the "Seinfeld" star when Kesha ran up to him in an attempt to get some PDA. "I'm Kesha! I love you so much. Can I give you a hug?" she squealed upon meeting the actor. The actor immediately backed away and more sternly stated, "Yeah, no thanks." When he came back to his interview with McFly, he broke out in a fit of laughter. "I don't know who that was!" he told the host, who explained it was Kesha. "OK! Well, I wish her the best."